Click below to listen to the speech. I want you to think with me this morning from the subject: “Rediscovering Lost Values.” “Rediscovering Lost Values.” There is something wrong with our world, something fundamentally and basically wrong. I don’t think we have to look too far to see that. I’m sure that most of you would agree with me in making that assertion. And when we stop to analyze the cause of our world’s ills, many things come to mind. We begin to wonder if it is due to the fact that we don’t know enough. But it can’t be that. Because in terms of accumulated knowledge we know more today than men have known in any period of human history. We have the facts at our disposal. We know more about mathematics, about science, about social science, and philosophy than we’ve ever known in any period of the world’s history. So it can’t be because we don’t know enough. And then we wonder if it is due to the fact that our scientific genius lags behind. That is, if we have not made enough progress scientifically. Well then, it can’t be that. For our scientific progress over the past years has been amazing. Man through his scientific genius has been able to dwarf distance and place time in chains, so that today it’s possible to eat breakfast in New York City and supper in London, England. Back in about 1753 it took a letter three days to go from New York City to Washington, and today you can go from here to China in less time than that. It can’t be because man is stagnant in his scientific progress. Man’s scientific genius has been amazing. My friends, all I’m trying to say is that if we are to go forward today, we’ve got to go back and rediscover some mighty precious values that we’ve left behind. (Yes) That’s the only way that we would be able to make of our world a better world, and to make of this world what God wants it to be and the real purpose and meaning of it. The only way we can do it is to go back (Yes) and rediscover some mighty precious values that we’ve left behind. The first is this—the first principle of value that we need to rediscover is this: that all reality hinges on moral foundations. In other words, that this is a moral universe, and that there are moral laws of the universe just as abiding as the physical laws. (Lord help us) I’m not so sure we all believe that. We never doubt that there are physical laws of the universe that we must obey. We never doubt that. And so we just don’t jump out of airplanes or jump off of high buildings for the fun of it—we don’t do that. Because we unconsciously know that there is a final law of gravitation, and if you disobey it you’ll suffer the consequences—we know that. Even if we don’t know it in its Newtonian formulation, we know it intuitively, and so we just don’t jump off the highest building in Detroit for the fun of it—we don’t do that. Because we know that there is a law of gravitation which is final in the universe. (Lord) If we disobey it we’ll suffer the consequences. Most people can’t stand up for their convictions, because the majority of people might not be doing it. (Amen, Yes) See, everybody’s not doing it, so it must be wrong. And since everybody is doing it, it must be right. (Yes, Lord help him) So a sort of numerical interpretation of what’s right. My friends, that attitude is destroying the soul of our culture. (You’re right there) It’s destroying our nation. (Oh yes) The thing that we need in the world today is a group of men and women who will stand up for right and to be opposed to wrong, wherever it is. (Lord have mercy) A group of people who have come to see that some things are wrong, whether they’re never caught up with. And some things are right, whether nobody sees you doing them or not. And then there is a second thing, a second principle that we’ve got to go back and rediscover. (Help him) And that is that all reality has spiritual control. In other words, we’ve got to go back and rediscover the principle that there is a God behind the process. Well this you say, “Why is it that you raise that as a point in your sermon, in a church? The mere fact we are at church, we believe in God, we don’t need to go back and rediscover that. The mere fact that we are here, and the mere fact that we sing and pray, and come to church—we believe in God.” Well, there’s some truth in that. But we must remember that it’s possible to affirm the existence of God with your lips and deny his existence with your life. (Amen, Preach) The most dangerous type of atheism is not theoretical atheism, but practical atheism (Amen)—that’s the most dangerous type. (Lord have mercy) And the world, even the church, is filled up with people who pay lip service to God and not life service. (That’s right, Filled up with, Come on, Lord help him) And there is always a danger that we will make it appear externally that we believe in God when internally we don’t. (Yes) We say with our mouths that we believe in him, but we live with our lives like he never existed. (That’s right) That is the ever-present danger confronting religion. That’s a dangerous type of atheism. We just became so involved in getting our big bank accounts that we unconsciously forgot about God—we didn’t mean to do it. We became so involved in getting our nice luxurious cars, and they’re very nice, but we became so involved in it that it became much more convenient to ride out to the beach on Sunday afternoon than to come to church that morning. (Yes) It was an unconscious thing—we didn’t mean to do it. I looked for audio of this and couldn’t find it either. It just doesn’t read well not being able to hear the inflection of his voice. I’m not too sure about the universe having morality. I like that he was able to see that humanity was headed down the wrong path way back in 1954, but him being a preacher it is tied to morality. And morality on a universal level. I agree that some things are wrong and some things are right. That there is a universal truth to it. That of which we’ve been speaking of or trying to search after. But when it gets tied to morality we have a bit of a puzzle because who defines that morality. For example the podcast I posted above is interesting to me because it shows an opinion of the fundamental secularist being just as guilty as the fundamental right for pushing many of the same views and being guilty of demonizing the Muslim world. I find that interesting as the two belief systems are so fundamentally different but at their core they seem to have similarities. I’m getting a similar reading from with the interview Father Moab is doing with Dr. Gairdner. Dr. Gairdner seems to be so right in many of his views that he’s liberal and then so left in some of his views he’s right. If we are to continue this search for universal truth I believe it will be found somewhere in between. In the middle way. To me the center is where we find compassion for others views. But the center also can fall prey for being accepting of everyone’s views. So it’s a double edged sword too. I liked how this interview/debate showed that no matter what, fundamentalism can be the same wherever it comes from and that the search for utopia is an illusion and that humankind has been born out of suffering and we will die in suffering. 1. All is suffering (dukkha). 2. Suffering is caused by desire/attachment. 3. If one can eliminate desire/attachment, one can eliminate suffering. Thanks for the note on where to find audio of MLK. I appreciate it. yeah, i bought the audio book “A Knock at Midnight” a few years ago, it has a great number of his sermons on it. you can really hear the depth of his mysticism in his voice. i am a mystic, which means for me, when i hear him talk about the innate moral character of the universe, i see that as a deep connection with being, and that it is affirming humanity as a divinely inspired part of the struggle the universe represents, between light and darkness. i see this struggle everywhere, the tension of opposites. there are stars and black holes, and there are planets cast in shadow when turned away from the sun, and bright and shiny when facing it. we humans have looked up at the stars for thousands of years, so much so that when you now look at the earth from space, you see what looks like a mirror, an image of stars, all the little lights we have created to mirror our universe. 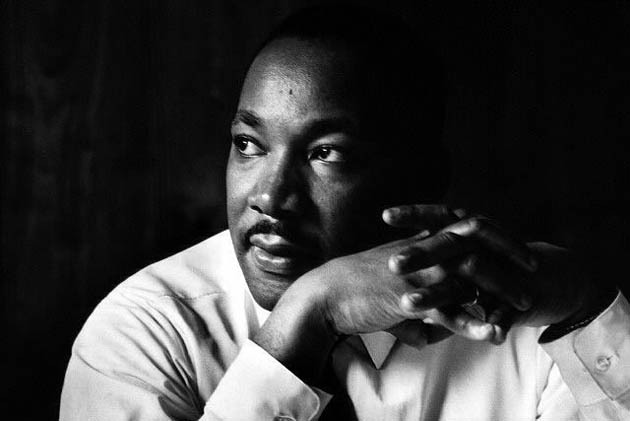 for me, when I hear MLK speak of the moral nature of the universe, I am not hearing a simplistic morality of a typical right-wing fundamentalist, but the high morality of deep thought and deep essential being. i think there is a profound difference. i don’t think King thought he would ever see perfection or utopia in the world, i think he was happy to give his life to progress, which to me is an act of faith so profound that i still struggle to understand it. and the history of progress is made by such men and women. i see that in David Simon, painting a real picture of the world, providing a mirror so that our choices become more informed. When King says, “There is something wrong with our world, something fundamentally and basically wrong.” I could easily hear that framed in artistic terms “There is something wrong with the art world, something fundamentally and basically wrong.” and when i say that, and we get attacked for it, it is because a kind of stubborn fundamentalist piety, that in itself is the problem. I am a mystic, and I want more mysticism in the arts, more religiousness, in a poetic spiritual sense, more looking out at the stars, more love of one another, and less competition, less market driven thinking. Amen Akbar. Thanks for clarifying. It’s a beautiful thing to think of the universe having an innate morality. Of a small star being gobbled up by a black hole and how that’s the a battle of light vs. dark. Yin vs. the yang. It really helps me see where you are going with this and helps me to learn more about your own belief system. Thanks for sharing that. I’m sure if I heard the inflection in his voice it would have made more sense but it could easily be read as an us against them mentality. Especially that shout out to atheists. And I’m totally about breaking down the us against them mentality even though I am guilty of it as are we all. I personally have issues with the major religions. I have at times demonized many of them so I am guilty of the same sort of fundamentalism I fear the most. I’m all for building bridges between these belief systems so we can come to the middle way. I do find it odd that in declaring there is something wrong with the art world we too are cast down into the fiery pit. Shunned by our own brothers and ostracized by my local art community. Yes there is something fundamentally wrong with the art world. There is something fundamentally wrong with the Jacksonville art community. Instead of seeking and searching we are hiding and protecting. There can be no community built through such fearful actions. We have to be ready to talk the talk and walk the walk, much like MLK. It is my belief that artists have an obligation to do so. A little bird gave me a link to the audio recording. I added it to the top of the post. Thanks for shooting me the URL. Appreciate it. Adds a lot to be able to hear it. there have been christians of divine artistry, there have been muslims of profound poignancy, there have been jews of genuine genius, and the list goes on. Religion for some is simply a style of approaching one’s higher power, and the true mystics understand that we are all cut from the same cloth. i hate organized religion inasmuch as I believe religion is too important for organization. At the root of all religion is the call for a man or woman to face God, to present oneself to the great mystery, naked, and receive direction. organizations more often than not, obscure this most central aspect of the text, and it is no mystery why. my love of spiritual life is what enriches my art process, my belief about direct confrontation with the mystery is what I think facing a new work of art is all about. Martin Buber’s notion of I and Thou, when i face a blank canvas with the absurd intention of making something new, my only comforts are those before me who faced impossible odds and made a choice to try anyway. deep within all my work here on globatron is the belief that there are two ways one can make art. one, to do what i’ve been describing here, remaining conscious to the deep mystery of being, and creation. and two, engage in unconscious play dependent upon a social structure that allows that. i prefer the former to the latter, because i think the latter is too dependent upon a very questionable social structure, one with ties to radical social inequality and oppression. yeah man, he was more than a preacher, he was a truly realized person, fully integrated philosophy, spirituality, social activist, writer, mystic. definitely a hero to me. Martin Luther king had a way to see the world clearly. This speech is timeless and is as valid today as it was then and will be in our uncertain future. It is a beam of light in the darkness, which can help us answer simple questions such as: ” why do bad things happen to good people?”.